A Louisiana recipe of rice, spices, and ground meat or ground sausage. Total preparation time of 30 minutes. This is an 8oz box. 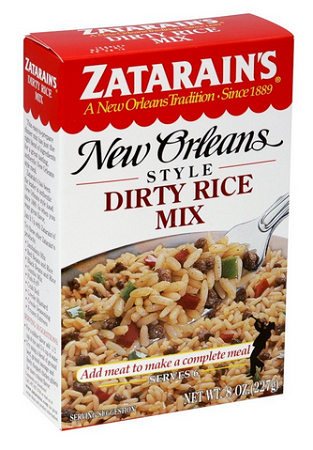 Each Zatarain’s mix, plus one pound of meat, makes six cups of dirty rice and is ready in just 30 minutes. Traditional dirty rice is often made with chicken gizzards and livers, giving it a brown, “dirty” color, but you can use any meat you want. Ingredients Enriched Long Grain Parboiled Rice (Rice, Iron, Niacin, Thiamine Mononitrate, Folic Acid). Sea Salt, Onion, Salt, Red & Green Bell Pepper, Garlic, Yeast Extract, Spices (Including Red Pepper), Soy Sauce (Hydrolyzed Protein, Corn Syrup Solids, Salt), Monosodium Glutamate (Flavor Enhancer), Caramel Color, And Paprika. 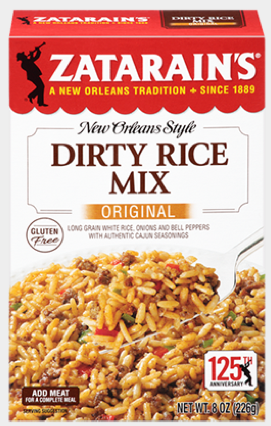 Serving size 1/4 cup dry mix (38g) = Makes 1 cup prepared 1 pkg. Rice Mix 1 lb. ground beef 1 tbsp vegetable oil or olive oil (optional) 2 ½ cups water Add 1 lb. cooked ground beef to complete your meal. STOVE TOP DIRECTIONS 1. BROWN 1 lb. ground beef in 3-quart saucepan. Drain fat. 2. STIR 2 ½ cups water, Rice Mix and 1 tbsp. vegetable or olive oil (optional) into saucepan until well blended. 3. SIMMER 25 minutes or until rice is tender. 4. REMOVE from heat. Let stand 5 minutes. Fluff with fork before serving. MICROWAVE DIRECTIONS 1. MIX 2 ½ cups hot water, Rice Mix, 1 lb. ground beef, cooked and drained, and 1 tbsp. vegetable or olive oil (optional) in 2 ½ quart microwavable bowl until well blended. Cover. 2. MICROWAVE on HIGH 5 minutes. Stir. Microwave on MEDIUM (50% power) 16 minutes or until rice is tender, stirring occasionally. Let stand in microwave 5 minutes. Fluff with fork before serving. Microwave ovens vary; adjust cooking times as needed. Cooking times are based on an 1100 watt microwave oven. Caution: Bowl and contents will be very hot. Use pot holders when removing from microwave.